It is as cold as Eskimo country in Johannesburg, and the Inkanyiso crew is out and about in Rosebank Mall as we spot a group of vibrant singers and talented dancers. This Youth Day celebration marks a year since the group started, and it has been a special journey that has created an amazing dance family. 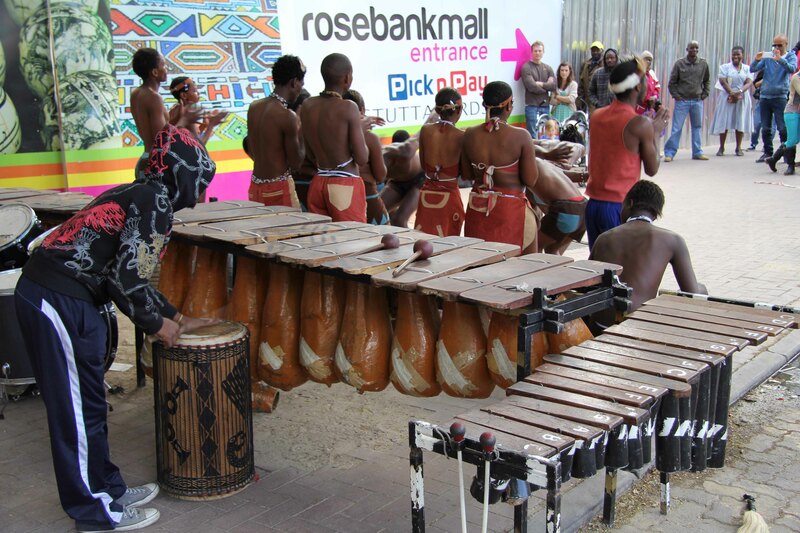 Baloi Bammino dancers outside Africa Market, Rosebank Mall. As we celebrate youth month, it makes me very proud that, though not always visible, some aspect of our democracy – what the Youth of 1976 fought for – can be seen in the spirits of these performers, singing their hearts out, and stomping their feet proudly with a range of dance styles reflecting the diversity in the Botswana culture. 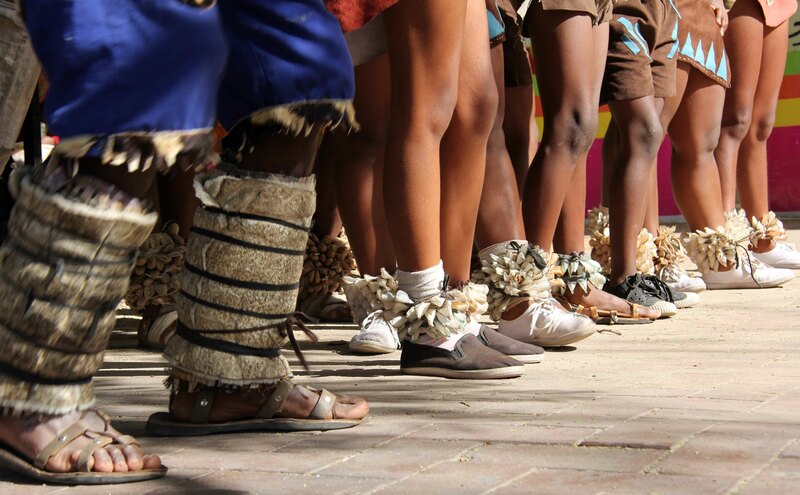 From Mohlakeng Ext 7, Randfontein, Baloyi Bammino Cultural Dance is performed by a group of young men and girls who come from different backgrounds and different corners of life. Dressed in traditional attire, braving the cold weather of Johannesburg, they put on a world class performance that drew spectators from their shopping duties to take a moment to experience true culture firsthand. The young ladies would make any parent proud, wearing traditional skirts elongated at the back, complemented by brown tops decorated with beautiful, colourful patterns, and colourful head bands. For their part, the gentlemen have on traditional underwear that represents strength and the true nature of their background and cultures. Their stomping feet move in sync with the rhythmic sounds of the background drums and the chanting of the group, their dance styles often resembling the movements of wild animals. Olebogeng Mosehweu, founder of the group, speaks of the pride that he has in his group and how far it has come, the purpose of the movement and the influence it has on people who watch them. “We started this group because we felt the need to keep children from the streets, to provide that glimpse of hope for their future”. Members are not recruited, but come forward voluntarily to be a part of the group. They are not making any money nor are the members paid. They perform in various shopping centres – where they are sometimes not allowed to perform due to prior arrangement not having been made – in the hope that people who watch them will throw money into a woven basket, to at least help with getting more equipment, and food on the table for the group. 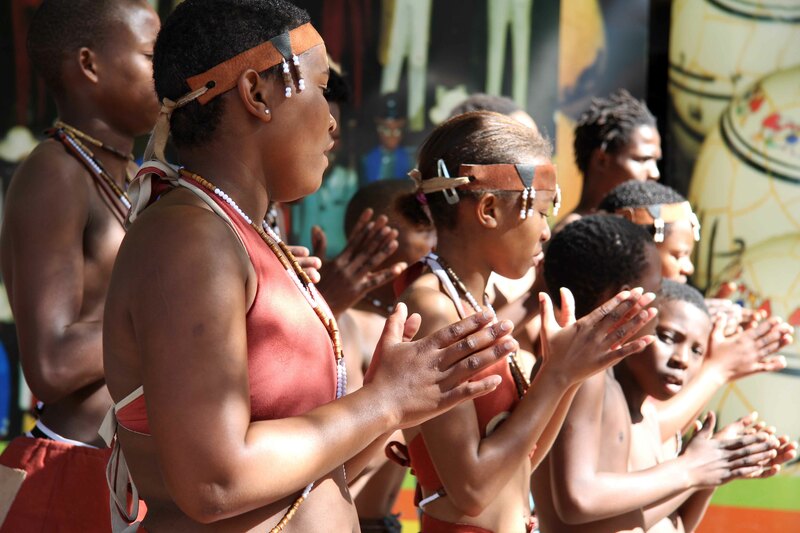 Performing once a week at the mall of Rosebank, these beautiful young minds aspire to tour overseas so that they can educate people from around the world about the indigenous dances of the Botswana culture. The intergenerational dialogue of this group is inspiring because the older folks are able to shape the younger minds, teaching them the values of their culture, and how to preserve it through the performing arts. This entry was posted in Another Approach Is Possible, Archived memories, Art Activism in South Africa, Art Solidarity, As we are, Before You, Celebrating Youth Month in SA, Crea(c)tive senses, Education, Entertainment, Exposure, Lack of Resources, Media works, Organizations, Our lives in the picture, Power of the Voice, Records and histories, Relationships, revolution, We Care, We Still Can with/out Resources, Youth voices, Zandile Makhubu and tagged Articles; Arts & Culture; Heritage; Tribes; Traditional; Traditions & customs; Rosebank;. Bookmark the permalink.